Linear strokes are more than just an artistic aesthetic; they represent boundaries, edges, and frontiers. Lines act as visual or physical limitations by forming fences, crosswalks, emotional barriers. We cross them. We build them. In 2002, artist Ivan Puig explored the subject of line in his outdoor installation/performance piece, KM7. Puig sought to build a literal representation of a nonliteral idea. According to his artist statement (loosely translated by Google), Puig sees the linear mark as an imaginary event. He believes the line acts as "...an element that contains and protects the difference between two states, material or ethereal, physical or conceptual, and that allows it to be transferred under certain conditions." Puig goes on to explain that when one crosses these boundaries, consequences ensue. 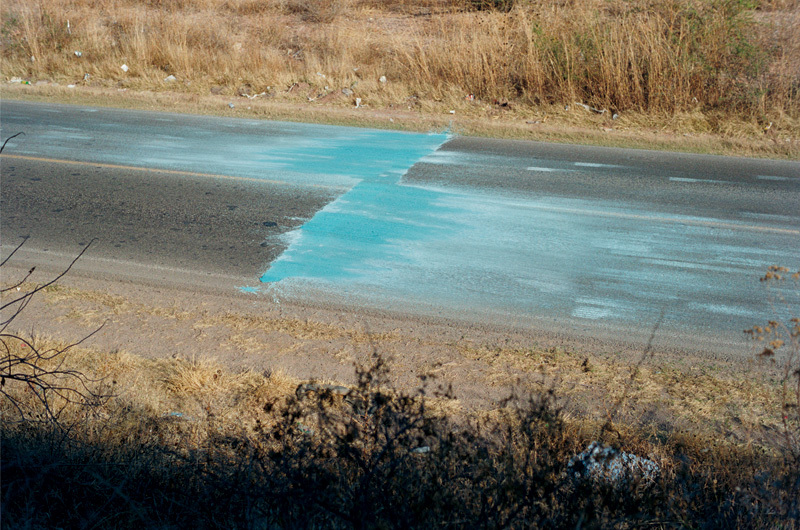 To give visual light to his concept, Puig laid down a boundary of a blue paint on a country road. Passing cars dragged the paint across the black tar forming ocular representations of said "consequence." What do you think? Was Puig successful in his visual interpretation?